With our busy schedules, The Chickpea and I don’t often get a chance to enjoy breakfast together. What, with me being a working girl again and him being so popular with the ladies (at least he comes home to me! ), breakfast is usually something quick that I can take on the road. After my first week back to work, The Chickpea surprised me by making breakfast for me. With no work to go to, I was able to sit down and enjoy a leisurely breakfast with the family. Unable to decide if we should have oatmeal or pancakes, I decided to go with both. I mean, it was Saturday- you’ve got to live it up sometimes! I made my own oat flour by throwing some rolled oats in the Vitamix and since I need a little protein in the morning, I combined the oat flour with chickpea flour. 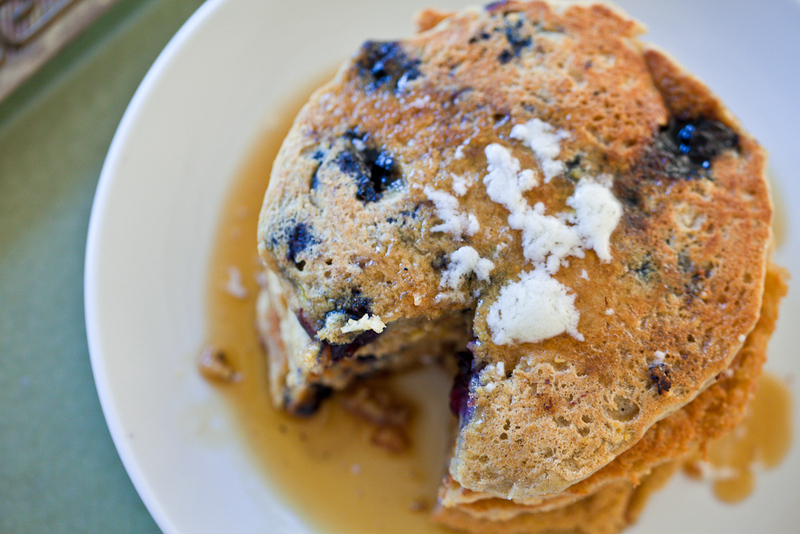 This gave these bright, fruit-filled pancakes a nice, hearty base. 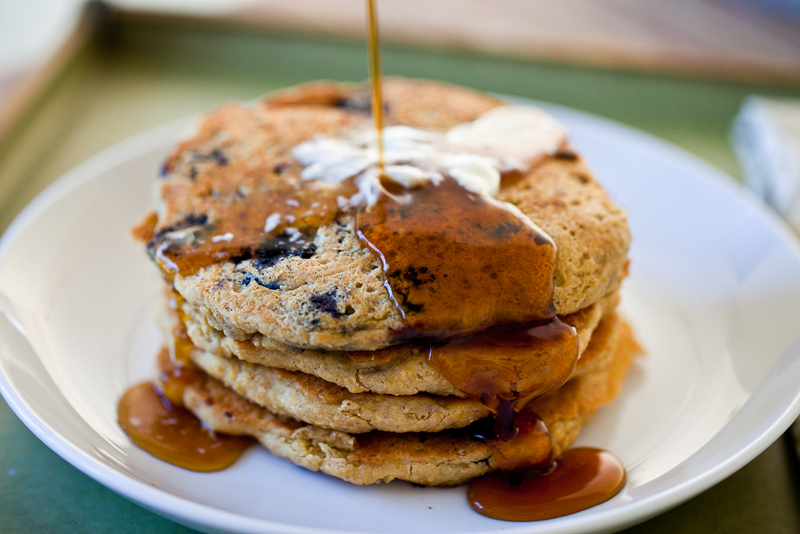 Topped with a little vegan butter and some maple syrup, these oatmeal pancakes were a creation made in breakfast heaven. They were a huge hit at our breakfast table. Even the youngins, one of whom has claimed he only likes plain pancakes, really enjoyed them. What I loved most about these pancakes, though, was how they not only indulged my occasional craving for a starchy breakfast, but they were also so filling. These pancakes also made me realize how important it is, even though life might be crazy and busy, to take time to enjoy the things that make me happy. Like pancakes and spending time with my family. Thank you for the timely reminder, Chickpea. You know me so well. Make your buttermilk by mixing your vegan milk with apple cider vinegar. Set aside to curdle. Place your oats in the food processor and process into a flour. Pour the oat flour into a bowl and add the rest of the dry ingredients. Use a whisk to fully combine. In a small bowl, add the egg replacer to the warm water. Use a whisk to beat it rapidly into a frothy mixture. Make a well in the middle of the dry ingredients and add in the frothy egg replacer mixture, the buttermilk, the oil, and the vanilla extract. Lightly mix all of the ingredients together until just combined. DO NOT OVERMIX. Lumps are good. Gently fold in the blueberries. Let the mix rest for about 10-15 minutes before using. Heat your pan over medium/low heat for a couple minutes. Very lightly spray the pan with vegan cooking spray and use a measuring cup (1/4 cup or 1/3 cup), also lightly sprayed with cooking spray, to pour the batter into the pan. Don’t overcrowd the pancakes, giving them enough room to spread as needed. Remember to respray the measuring cup and the pan in between pancakes. Once the pancake edges begin to lift up, after about 3-4 minutes, flip the pancake and let cook for another 2-3 minutes. Remove from heat and serve immediately or let rest on a cooling rack, covered with a clean kitchen towel or aluminum foil. Enjoy! 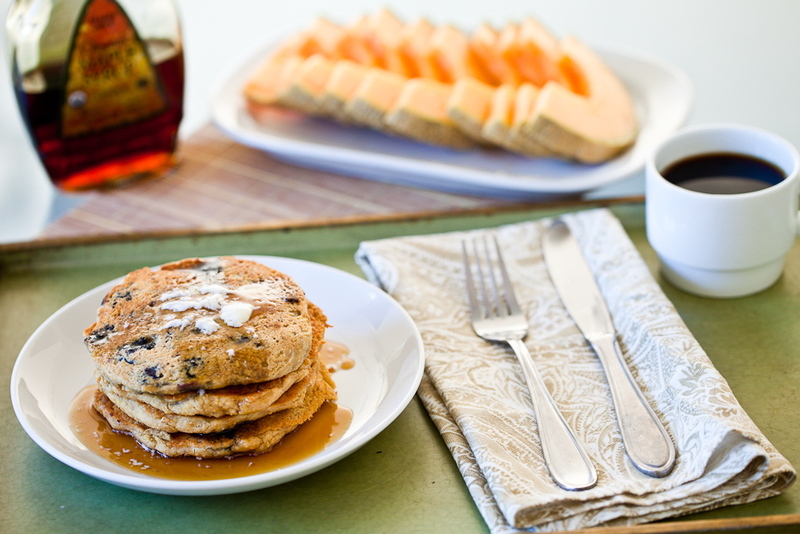 36 Responses to "Lemon Blueberry Oatmeal Pancakes"
Oh I just love these Kristy! I am soooo making these 🙂 I love that they are gluten-free and high in protein 🙂 Good thing I had plans to go to the health food store, chickpea flour has been added to the list! ysy for blueberry pancakes! i love that they are gluten-free, too 😉 i will have to make these for dayv soon 😉 i love how juicy the blueberries are! Now you’re talking. Nothing speaks to me like pancakes! Yum, when can I come over for breakfast!? These look awesome. Come on over anytime, Melissa! You can have all the pancakes you desire! Thanks! I usually just buy it from the bulk bins at Whole Foods, but in a pinch, I’ve just thrown the beans int he vitamix and blended till smooth. The pancakes look so light yet substantial — a perfect breakfast. I know a little someone who will be coming for breakfast on Sunday, and I think I may give these pancakes a try. She’s very picky, but these may win her over. 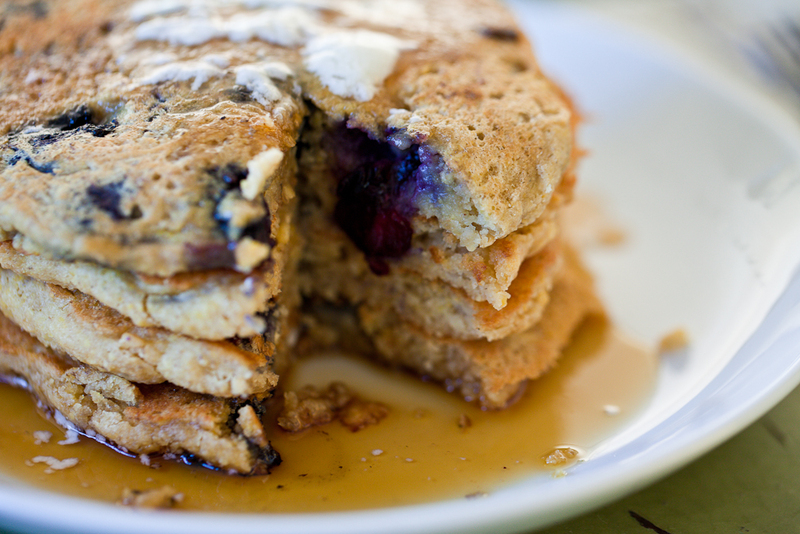 Pancakes, blueberries, lemon – these are some of my favorite things! These look fantastic! Gluten-free pancakes! YES YES YESSSS! Your chickpeaman is an angel!! Isn’t he, though? 😉 I’m glad you like the pancakes! The pancakes look so fluffy! Please send some over :)) these should happen this weekend. i have everything! can you taste the chickpea flour though. i find it noticeably bitter in sweet goods. Awww Your chickpea is so sweet hehe Breakfast food is the best. There is nothing like a good brunch, right?!?! 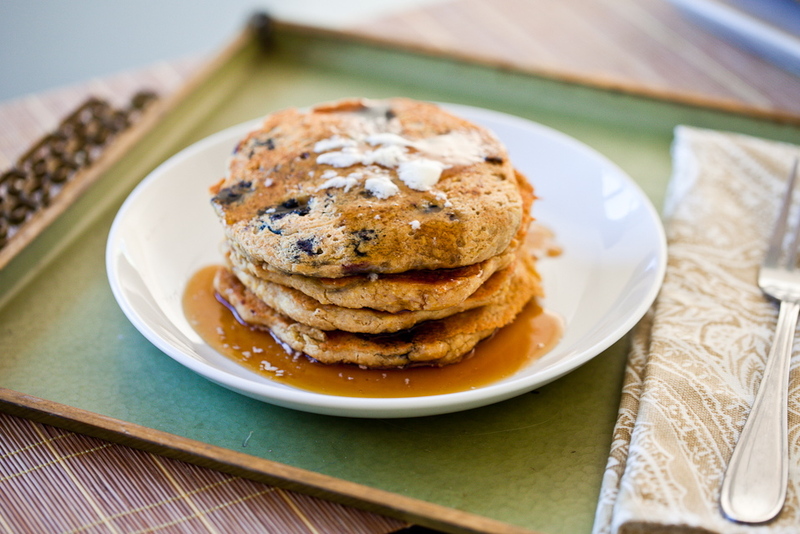 I can’t wait to try these, my last round of gluten free pancakes didn’t go so well! So creative Kristy! Thanks Somer- I hope you like them! 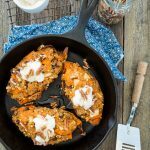 Caitlin at The Vegan Chickpea has some amazing gluten-free pancake recipes- I’ve made one of the recipes before and I was just floored. Soooo good! Wow, those are some good looking pancakes! 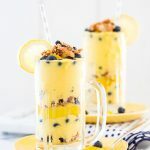 I love the big, juicy bursts of blueberries in them! Thanks, Cadry. 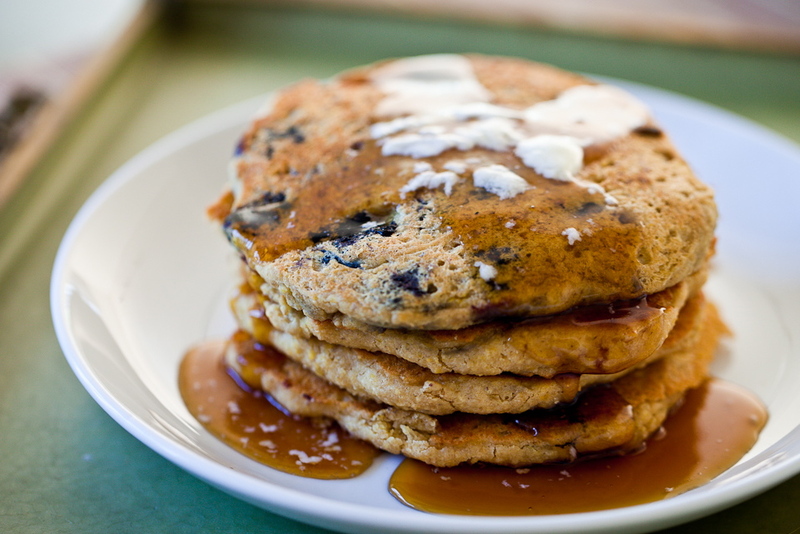 Blueberries just make any breakfast better, don’t they? I love that this scrumptious looking recipe tells you how to simply make a vegan buttermilk! This opens up a whole new world of vegan pancakes for me! Thanks! Oh yay! I’m so glad that you’ll be able to use that! Thanks for stopping by, Debby! 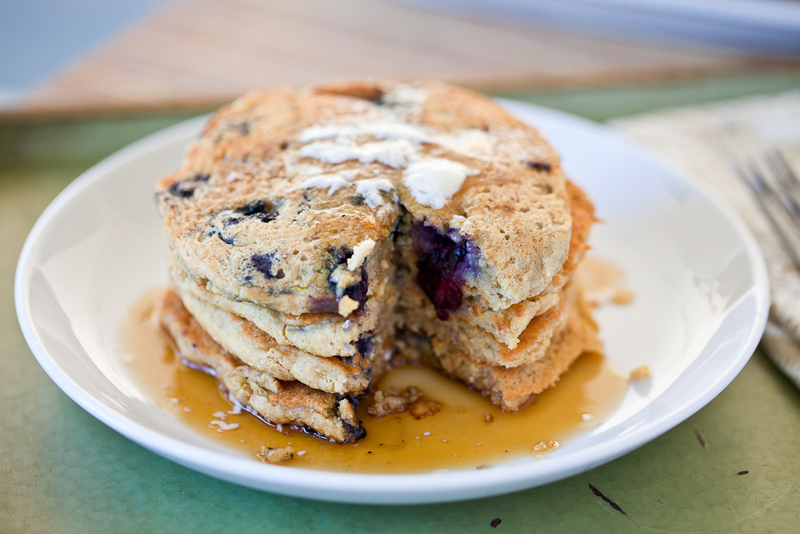 Never tried using chickpea with oat flour before for pancakes – definitely one for this coming Sunday! They look so thick and fluffy! I’m new to being vegan and just found your site. 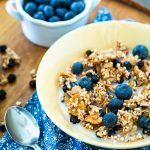 Can you tell me if I can use a flax or chia egg replacement instead of the powder? Wow, these look like heaven! Would chia seeds work instead of the egg-replacer?